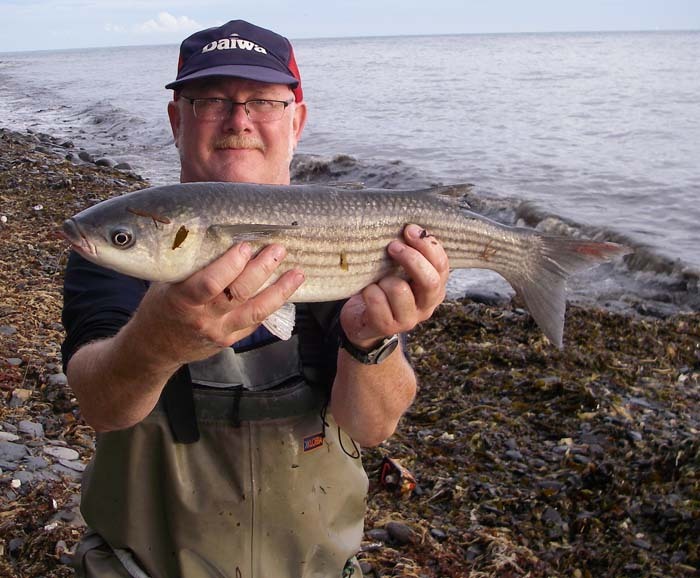 If you read angling books and magazines it won't be long before you come across someone telling you that "Flooding spring tides are the best for fishing!" Of course this is nonsense because fish have to eat, whatever the phase or state of the tide. In my own neck of the woods, along the Dorset coast, good fishing can be had on small neap tides as well as big springs, whether the tide is high or low, flooding or ebbing. Of course to capitalise on each set of conditions you have to be in the right place at the right time and this can take a bit of hard work to suss out. 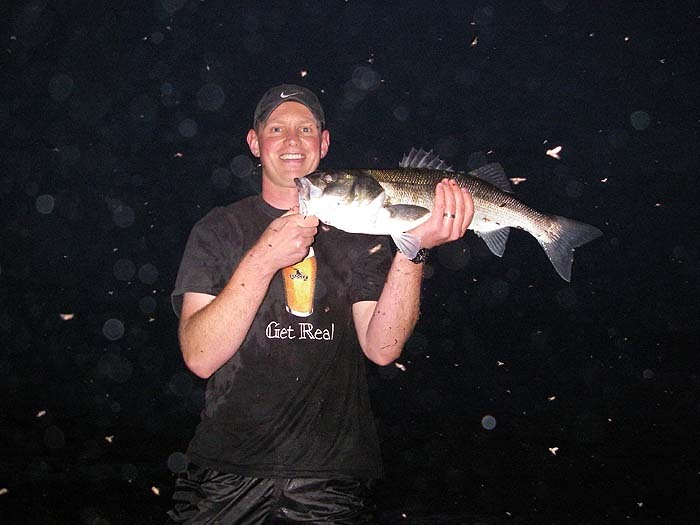 In sea fishing it's quite rare that you are actually able to see the fish that you are after but there is one exceptional circumstance when I see them regularly. 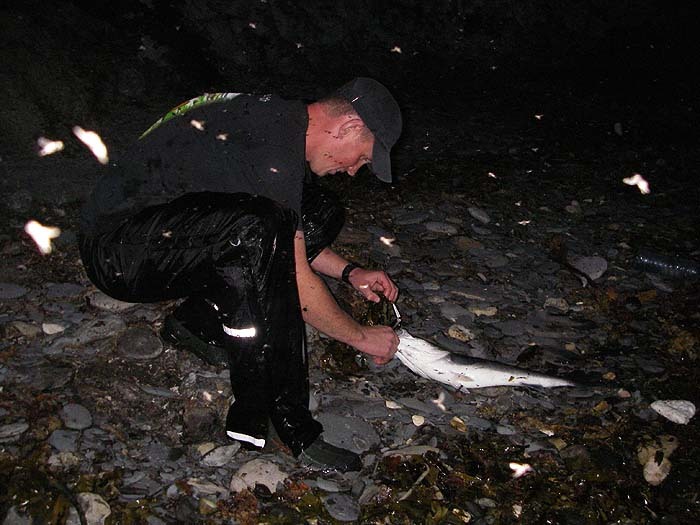 As it happens this particular event does only occur on the top of the spring tides when bass and mullet come inshore to feed on seaweed fly maggots. In fact it's even more specific than that because the evening tides are always a little bigger than the morning ones and they tend to coincide with the 'change of light' so that's the normally the best time to give it a go. This week my pals Dave and Nigel and myself opted to meet for a potential evening's sport. We chose a spot where weed middens regularly accumulate and where, all being well, the bass and mullet gather for their evening feast. For once we got it exactly right, at least the others did. I was delayed by a minor domestic crisis so by the time I got to the shore my pals had already caught several fish each. In fact as I hurried along the beach, thinking that I'd probably missed the best of the sport, I met Andy who introduced himself as one of my email correspondents. Andy paused from his spinning for a brief chat and I suggested that when he'd given that place a good try he might follow me along to the potential hot-spot. However, he was only wearing thigh boots and it seemed likely that he would get soaked so I wasn't sure whether he would (sensibly) opt to stay dry. Anyway, I left him fishing and plodded on until I reached the appointed place. 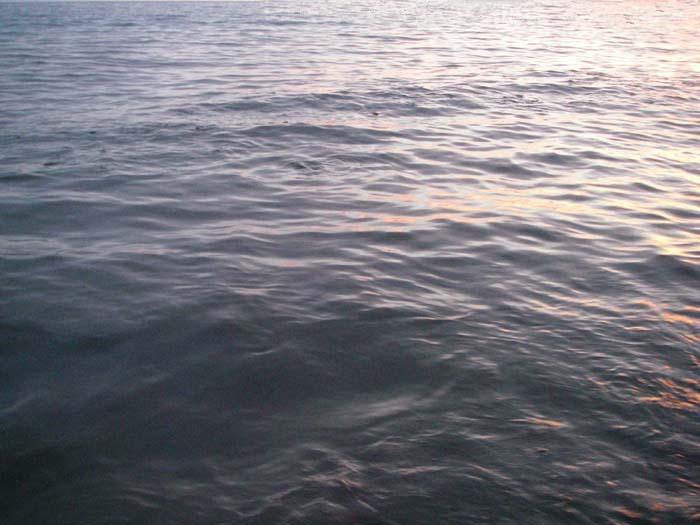 Already I could see lots of mullet in the water restlessly skimming maggots from the surface of the sea. As I arrived Nigel was into a fish on his fly gear so I took out the camera just in time to take his picture with a beautiful six pound thicklip. Then it was down to fishing. I was persisting with my soft plastic 'Slandra' and for a while it was on the quiet side. Dave was regularly catching bass on his favourite 'bubble float/Redgill set up but all I could get was gentle, unhookable tugs on the tail of my lure. I persisted and after a while I had a much stronger bite but the fish failed to stick. Was it going to be 'one of those sessions'? next cast I had the answer as a bass ripped into the lure, hooked itself and tore away splashing on the surface. After my fish went back I had another and another. The third fish managed to split the front of the lure so I had to change to a second string version - it caught nothing at all. By now Dave had switched to his own version of my weedless soft plastic and sure enough it produced his best fish of the session. Looking back along the shoreline I could see an isolated figure in the distance. He was clearly fishing and I wondered if it was Andy. The sun was beginning to set in spectacular fashion so I grabbed the camera and hurried back to try and get a picture of the lone spinner. Sure enough it was Andy and to his credit, although he was very wet and still fishless, he had politely refused to join us 'in case he got in the way'. 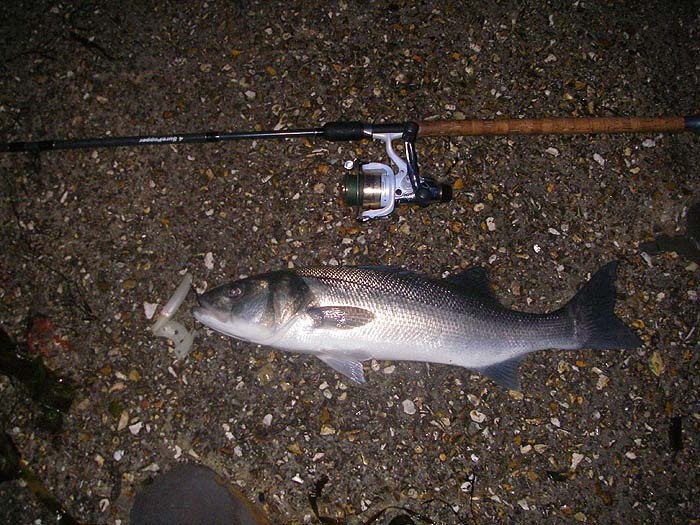 I invited him to come back along and have a go before the tide fell and the fish departed. 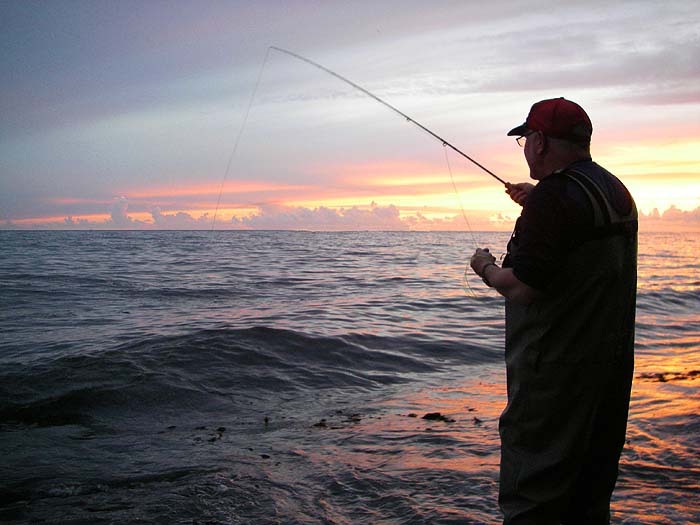 By now it was almost dark but he began casting and retrieving his J11f Rapala. The next time I looked up I saw Andy's rod well bent as he struggled to beach a fish through the waves and drifting kelp. I dropped my rod and picked up the camera in time to see him slide the bass ashore and stoop to unhook it. His first lure caught bass - all of six pounds. From his grin I guessed that it is unlikely to be the last time he tries lure fishing for these wonderful fish. To make up for my late start I got up the following morning and had another go. Dave was going to join me but, for once, his alarm clock failed him. I only had an hour to spare so there was no point walking all the way to the 'hot-spot' of the previous evening. In fact I spun along the first hundred metres of beach by the car park. After about half-an-hour of fruitless flogging with my repaired lure (five minutes with the plastic-glue seemed to have done the trick) suddenly there was a fierce take and I was into a nice bass. It proved to be exactly six pounds so I returned it and went home well satisfied. I should mention that the lure survives to fish another day.